ONE OWNER! 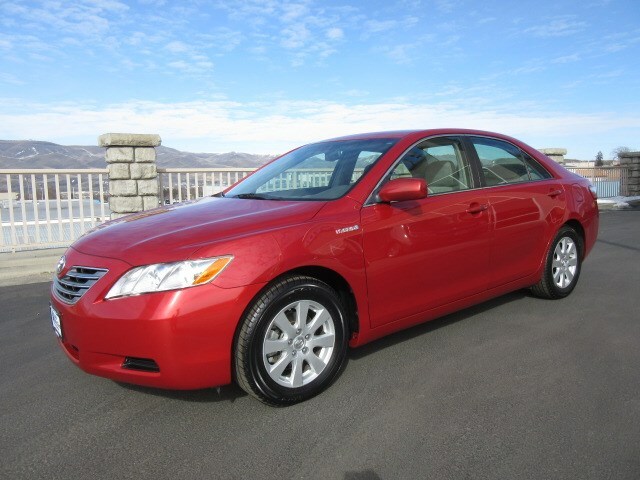 Check out our 2009 Toyota Camry Hybrid Sedan. We are waiting to save you money and make you feel good about it! The hybrid system is comprised of a 2.4 Liter 4 Cylinder gasoline engine and a 45-hp electric motor. The Camry Hybrid can run on any combination of the two power sources. Power is transferred to the Front Wheels via a seamless CVT. This Camry Hybrid's combination of the gas and electric motors feels surprisingly robust. Acceleration betters most four-cylinder sedans and is not far behind many six-cylinder ones. Our Camry Hybrid comes with soft cloth seats, AM/FM stereo, CD player, power sunroof, power windows/door locks, a leather-wrapped steering wheel with audio, cruise, and phone at your fingertips, keyless entry/start, and more. This Camry Hybrid is a complete package. It's roomy, safe, comfortable and fully up to date with the latest features. Print this page and call us Now...We Know You Will Enjoy Your Test Drive Towards Ownership! † Based on 2009 EPA mileage ratings. Use for comparison purposes only. Your mileage depending on driving conditions, how you drive and maintain your vehicle, battery-pack age/condition, and other factors.